Arsenal risks losing Alexis Sanchez for free next season, according to manager Arsene Wenger, who confirmed the club has made no progress on a new contract for the Chilean striker. 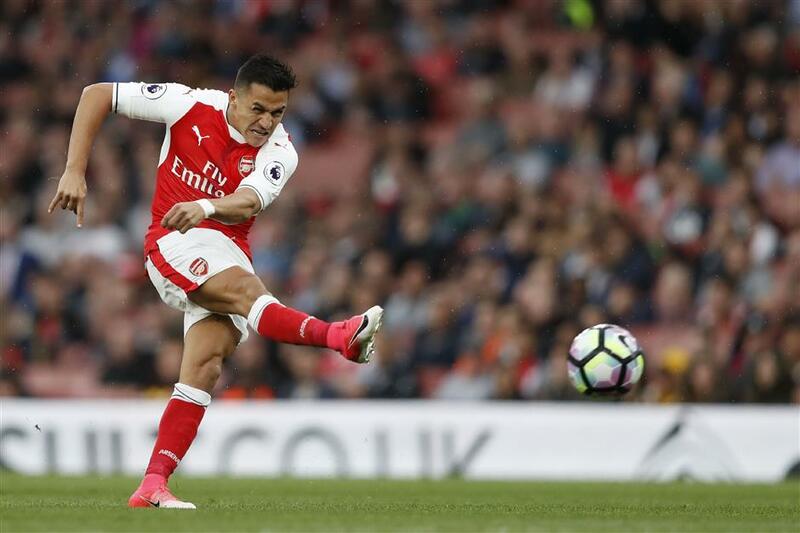 Arsenal's Alexis Sanchez takes a shot at goal during their English Premier League match against Sunderland at the Emirates Stadium in London in this May 16, 2017, photo. The Chilean striker is in the final year of his contract and Arsenal boss Arsene Wenger fears he could leave for free at the end of the season. Alexis Sanchez and Arsenal remain at an impasse over new contract talks, manager Arsene Wenger said on Wednesday. Wenger's admission will only heighten speculation the 28-year-old Chile international forward will join English Premier League rival Manchester City. Sanchez, who played under City manager Pep Guardiola at Barcelona, is presently injured with an abdominal strain which will keep him out of Saturday's game against Stoke City and prevented him from playing in the opening 4-3 win over Leicester City. "He (Sanchez) is a player who goes into the final year of his contract. We have not progressed on that front," said Wenger on Wednesday. "Let's not be wrong, it's not an ideal situation on the financial side and it demands some sacrifice. "But first of all it doesn't mean the players who are in the final year of their contract will not extend their contract. You have still that possibility and we work on that as well." If no contract extension is agreed and Sanchez stays at the Emirates, he could leave for free at the end of the season. "That is a consequence of what I say, yes, unfortunately," added Wenger. "But we have to make a choice between efficiency on the field and financial interest, and most of the time if you can find a good compromise, it's better. "But in this case, I think I prioritize the fact that he will be useful on the sporting side." However, Wenger took positives out of the fact neither Sanchez nor England midfielder Alex Oxlade-Chamberlain — who has been linked with a move to champion Chelsea — had handed in a transfer request, unlike Liverpool's Brazilian star Philippe Coutinho who wants to move to Barcelona. "Yes, I am very happy about that," said Wenger. "It's important you have a serene atmosphere inside and clarity about your commitment. "It's important the players aren't half in and half out, and they are completely in." Wenger is adamant Oxlade-Chamberlain will remain and predicted great things for him. "I'm convinced that he will be in the next two or three years the English player everyone looks at," said the Frenchman. Wenger, who signed a new contract of his own after Arsenal salvaged a disappointing last season by beating Chelsea in the FA Cup final, said he agreed with the likes of Liverpool's Juergen Klopp that the transfer window should close prior to the season beginning, rather than August 31, as is currently the case. "I would support it," said Wenger. "It's better for the season, for our psychological comfort as a manager." Meanwhile, German defender Shkodran Mustafi and Frenchman Francis Coquelin are in contention for a place in the side to play Stoke.